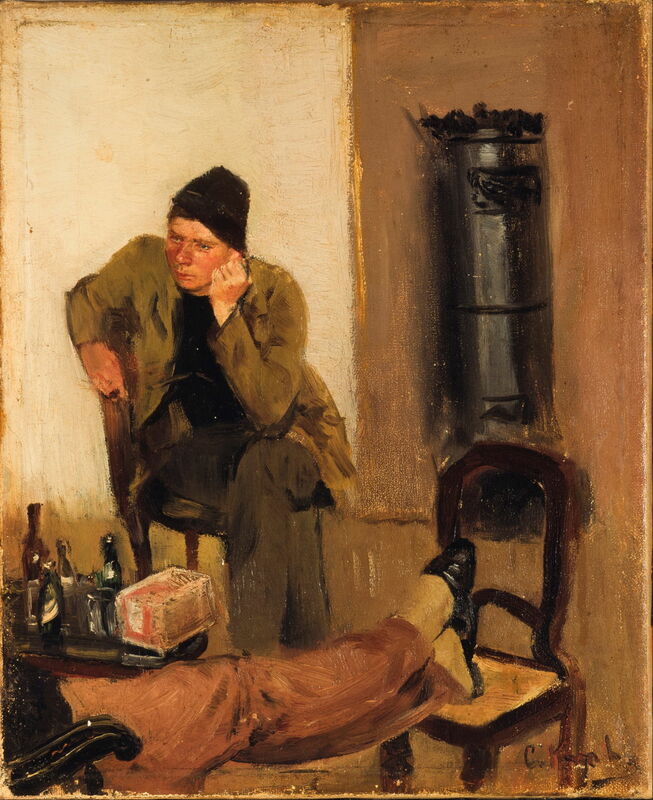 Christian Krohg (1852–1925), Hard Alee (1882), oil, 50 x 60 cm, Nasjonalgalleriet, Oslo, Norway. Wikimedia Commons. Some artists, while never achieving any particular international fame, are of great and lasting influence. A good example is Christian Krohg (1852–1925), who is now little-known outside his native Norway, but was a major influence over northern European and Nordic painting well into the twentieth century. He was important in the artistic development and life of Edvard Munch, was the first professor and director of the Oslo State Academy of Art, a widely-read author and critic, and a social and political campaigner. In this series of articles, I will consider his social realism, or ‘naturalism’, as reflected in his paintings, spanning themes such as poverty and prostitution. Krohg’s background was anything but poor: his grandfather had been a government minister, and his father was a lawyer and statesman. Nevertheless, his mother died when he was only eight years old, and the oldest of his four sisters, Marie, became responsible for running the household and bringing him up. His family’s expectation was that he would study law; his aspiration was to become a painter. The compromise was that he studied law for four years at university, and attended a drawing school. From then on, his draughtsmanship was superb, although I regret that I won’t be covering his drawings or illustrations in this series. In 1873, with the death of his father and the completion of his law studies in Oslo, he went to study painting in Karlsruhe, Germany, where he was taught by the great Norwegian landscape artist Hans Gude, among others. In 1875, he transferred to the Royal Academy in Berlin, where he was inspired to become a ‘naturalist’ by Max Klinger and Georg Brandes. 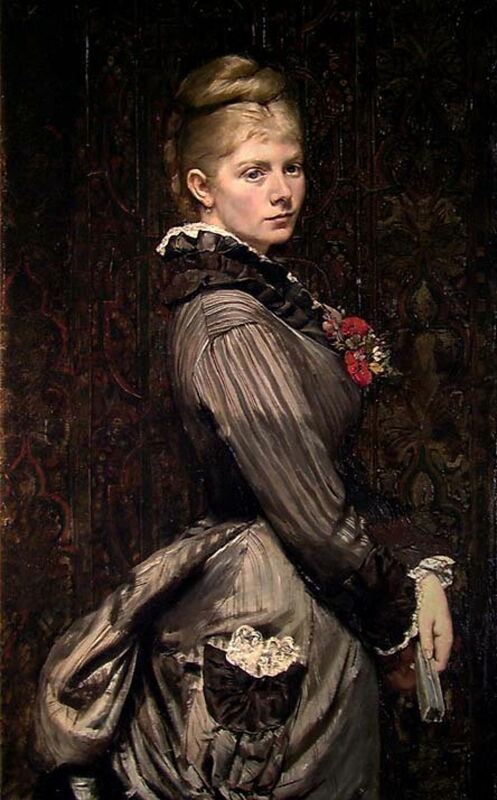 Christian Krohg (1852–1925), Portrait of Lucy Parr Egeberg, 1876 (1876), oil on canvas, 111 x 83.5 cm, Nasjonalgalleriet (gift from Amélie Egeberg), Oslo, Norway. Courtesy of Nasjonalgalleriet. Among the earliest of Krohg’s surviving paintings is his Portrait of Lucy Parr Egeberg, 1876, a fine demonstration of his skills in line and form. Christian Krohg (1852–1925), Woman Cutting Bread (1879), oil on canvas, 80 x 60 cm, Bergen kunstmuseum, Bergen, Norway. Wikimedia Commons. In 1879, on the encouragement of the artist Frits Thaulow, Krohg travelled to Skagen, at the northern tip of Jylland (Jutland) in Denmark, where he joined the group of Nordic painters there who were working largely in Impressionist style. Krohg there started his first major project, which over the next decade documented the lives of the Gaihede family of Skagen. 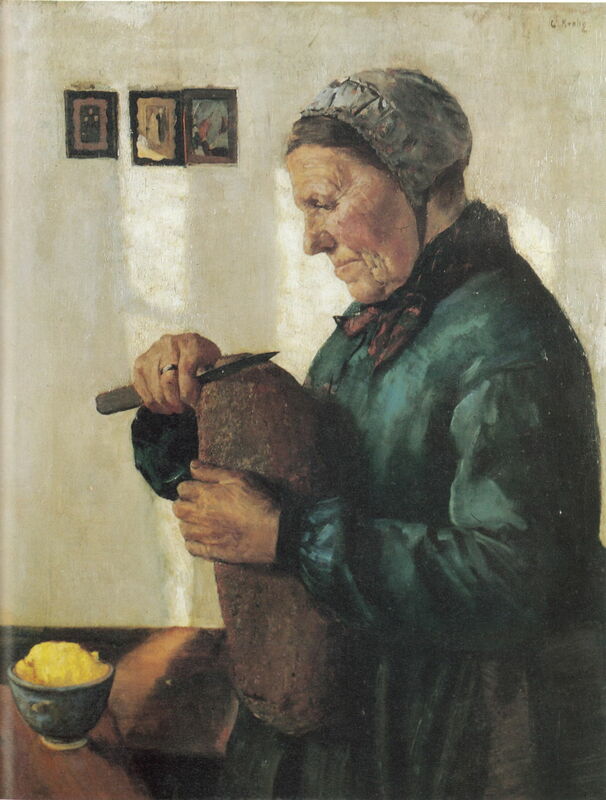 His early painting of Ane Gaihede as a Woman Cutting Bread (1879) marks the start of his social realism. Krohg documents her in almost ethnographic detachment. She is aligned in profile, against an almost bare wall, perfectly framed at three-quarter length. 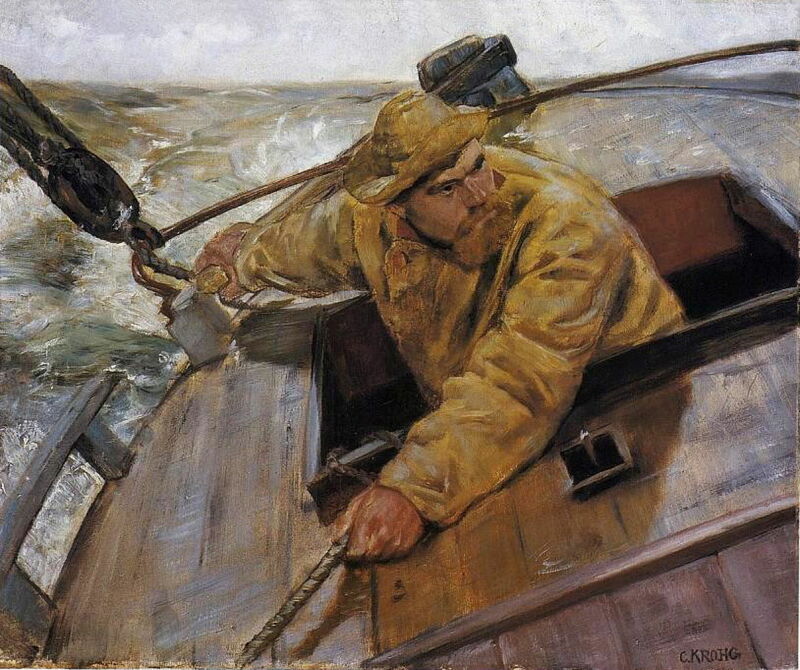 Christian Krohg (1852–1925), Port Side! (1879), oil on canvas, 99 x 70 cm, Nasjonalgalleriet, Oslo, Norway. The Athenaeum. 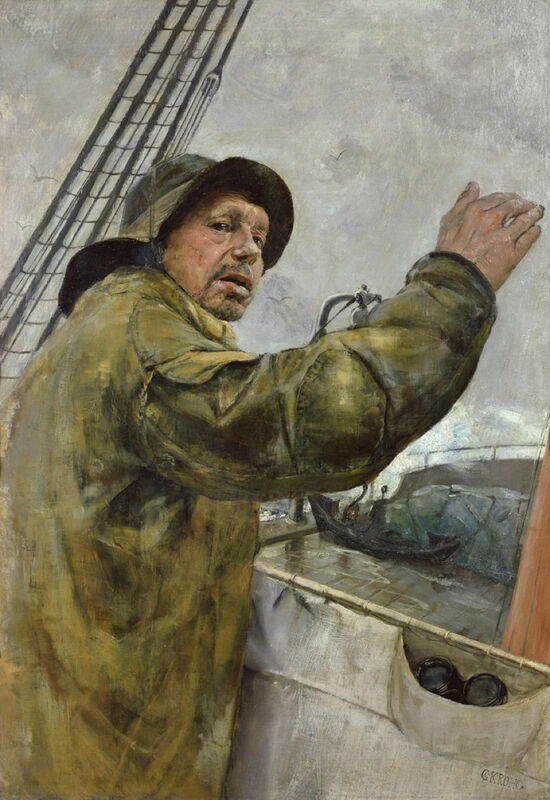 Another major work from this period started a career-long series of paintings of working seamen, in Port Side! (1879). Krohg started this when he was still in Berlin, and completed it when at Skagen that first summer. It was one of two of his paintings exhibited at the Salon in Paris in 1882, and although it didn’t attract a great deal of critical attention, the reviews it received were very positive. Krohg crops this painting much closer, leaving just a few millimetres beyond the tips of his fingers. He adds the dynamics by ensuring that no lines are anywhere near horizontal or vertical, and you can almost feel the heel of the ship’s deck under your feet. The seaman’s oilskins have been patched repeatedly, and have deeply-ingrained grime. Christian Krohg (1852–1925), Niels Gaihede Netting (c 1880), oil on canvas, 93.5 x 67 cm, Nasjonalgalleriet (bought from A.C. Houens fund 1907), Oslo, Norway. Courtesy of Nasjonalgalleriet. 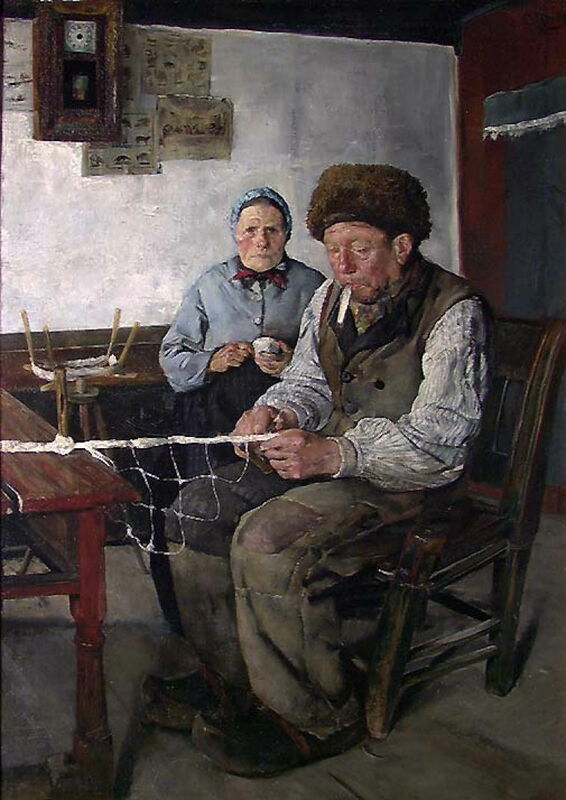 In Niels Gaihede Netting (c 1880), another painting in his Skagen series, he shows the Gaihedes together, with Niels hard at work on his fishing net, and Ane in the background, staring quite sternly. Their surroundings are less spartan, but still frugal: the furniture is basic wood, and has seen better days, probably many decades ago. A clock and some sheets of prints taken from a magazine are the only objects on the blank white wall behind. Niels wears large wooden working clogs, and his trousers have been patched many times. Christian Krohg (1852–1925), Sick Girl (1881), oil on board, 102 x 58 cm, Nasjonalgalleriet, Oslo, Norway. Wikimedia Commons. After his time in Skagen, Krohg started teaching at an art school for women, which in common with others across Europe was trying to address the growing demand from budding women artists, and the conservative attitudes which persisted in the major academies at the time. Perhaps influenced by this experience, he opened another theme which he was to explore repeatedly, that of illness in the family, with his Sick Girl (1881). The sickness is tuberculosis, then prevalent throughout Norway and much of the rest of Europe – King Death, as it was nicknamed at the time. The girl’s face indicates that her death is drawing near. On her lap is a single pale pink rose, its leaves dropped like tears down the blanket which covers her legs. Again Krohg crops the image with closeness and precision. 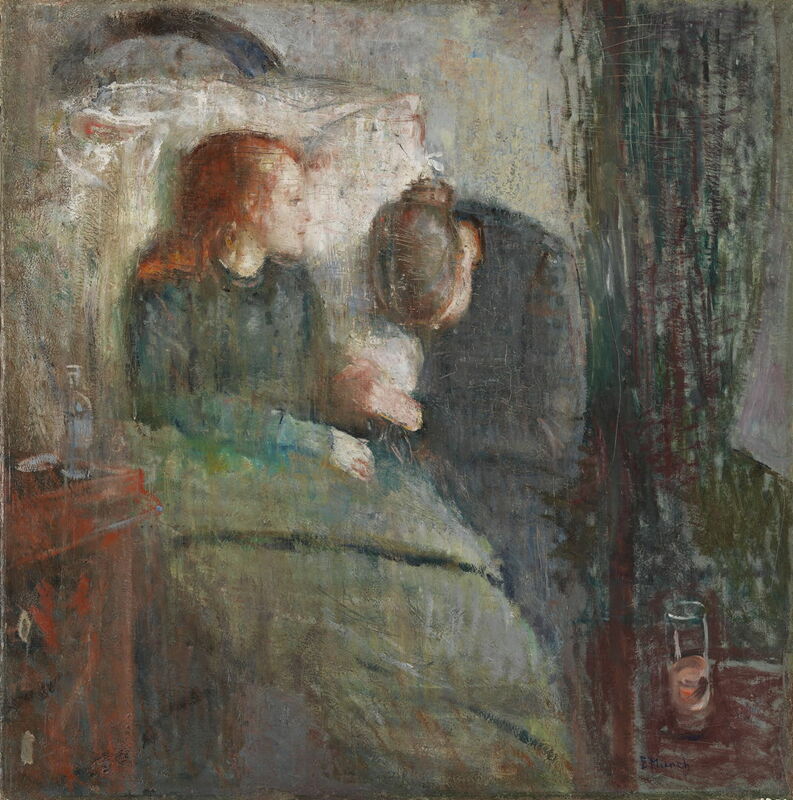 This was a direct inspiration for a motif taken up early in the paintings of Edvard Munch, who eventually made around twenty different variants of the same theme. 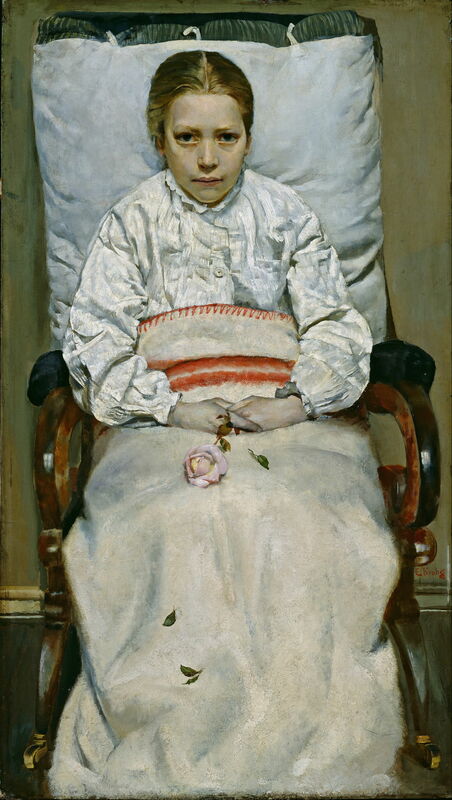 Below is one of his first, The Sick Child (1885–86). In 1881, Krohg met the Skagen artist Peder Severin Krøyer, and went to live in Paris for a year. He was particularly influenced by the Impressionists, Edouard Manet, and Gustave Courbet, together with the social realism of Jules Breton, Jules Bastien-Lepage, and Léon Lhermitte. Christian Krohg (1852–1925), Portrait of the Swedish Painter Karl Nordström (1882), oil on canvas, 61 x 46.5 cm, Nasjonalgalleriet, Oslo, Norway. Wikimedia Commons. 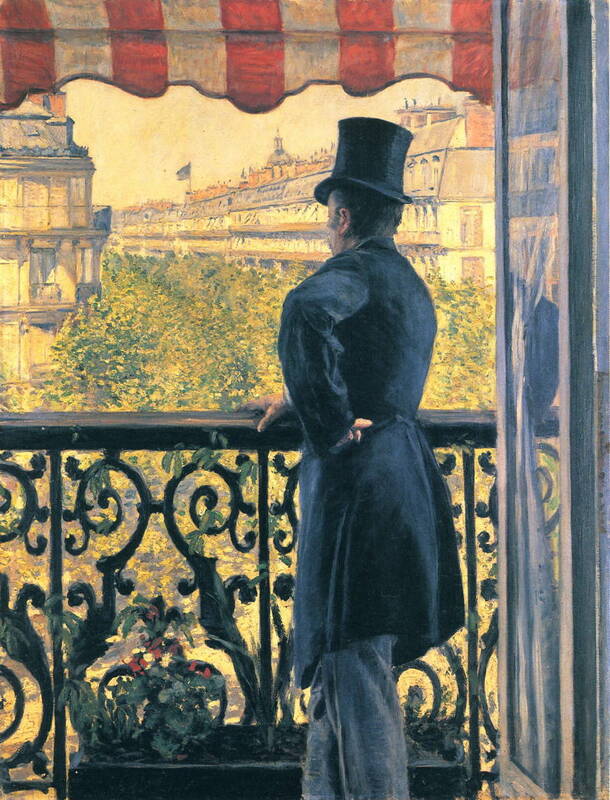 Among the Impressionists, he seems to have been most attracted to the work of Gustave Caillebotte. 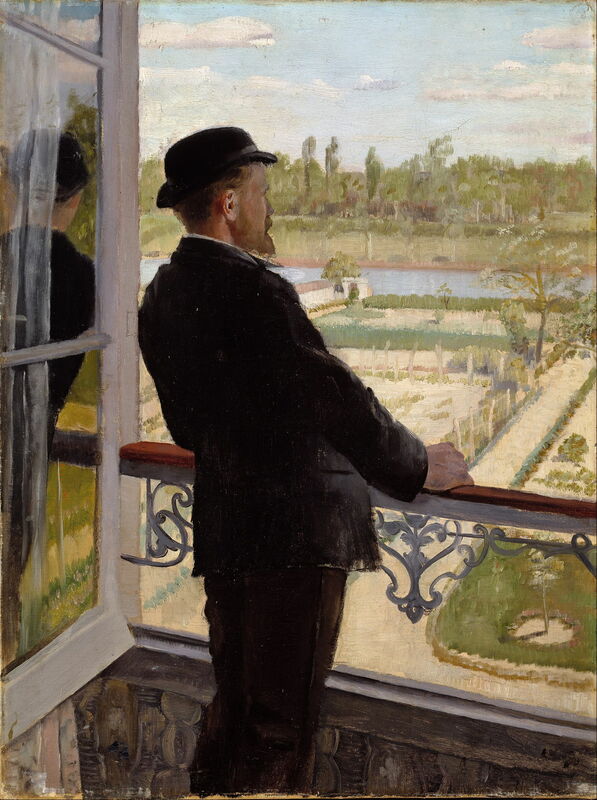 Krohg’s Portrait of the Swedish Painter Karl Nordström (1882) (above) appears to have been motivated by Caillebotte’s Man on a Balcony, Boulevard Haussmann (1880), below, which in turn was developed from Caillebotte’s earlier painting of his brother as a Young Man at His Window (1875). Curiously, Krohg did not paint this in Paris, but as he neared the end of his time in France in the artists’ colony of Grez-sur-Loing, during the Spring of 1882. 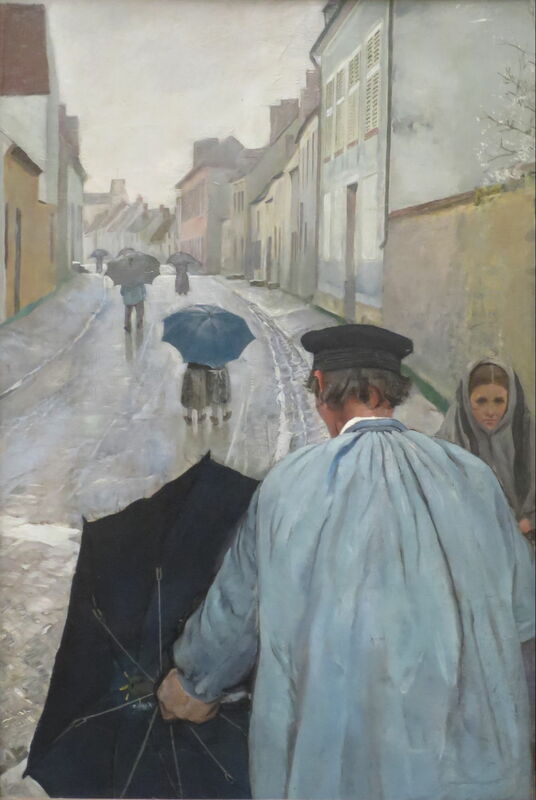 Perhaps just before Krohg went to Grez, he may have visited Normandy, to paint this interesting little view of a Village Street in Normandy (1882). Its curved recession of umbrellas with disembodied legs is quite unusual. Krohg then went to stay in Skagen over much of the next couple of years. His sailing painting Hard Alee (1882) was exhibited in the Salon in Paris that year, and was one of the silver wedding gifts that year from the Norwegian people to King Oscar II and Queen Sophia of Nassau – who were also the king and queen of Sweden, as the countries were in union at the time. This time his seaman is sailing a small yacht singlehanded. The tiller, his arms, and a line he is holding with his left hand trace a bold and dynamic zigzag down the centre of the canvas. Again Krohg is careful to ensure that there is only one horizontal (or vertical) line – the horizon. Christian Krohg (1852–1925), Charles Lundh in Conversation with Christian Krohg (1883), oil, 35.5 x 29 cm, Skagens Museum, Skagen, Denmark. Wikimedia Commons. Krohg’s paintings from this period at Skagen form an absorbing account of life in the artists’ colony there, and several are displayed in the excellent Skagen Museum there. Charles Lundh in Conversation with Christian Krohg (1883) shows this Norwegian painter who lived from 1856-1908, and Krohg’s legs. Lundh stayed in Skagen that summer, living in a house with Krohg, then painted in Persia for five years. Krohg visited Paris again in the Spring of 1883, then returned to Skagen for the summer. Christian Krohg (1852–1925), Self-portrait (1883), oil on canvas, 47.5 x 36 cm, Nasjonalgalleriet (bought 1991), Oslo, Norway. Courtesy of Nasjonalgalleriet. 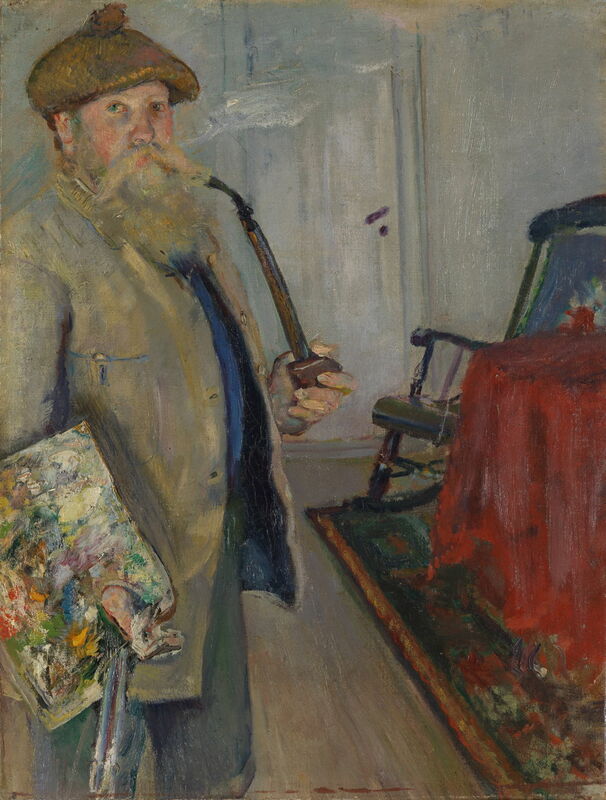 This Self-portrait (1883) of him clutching his huge smoking pipe with a well-used palette in the other hand, shows him at the age of about 31. 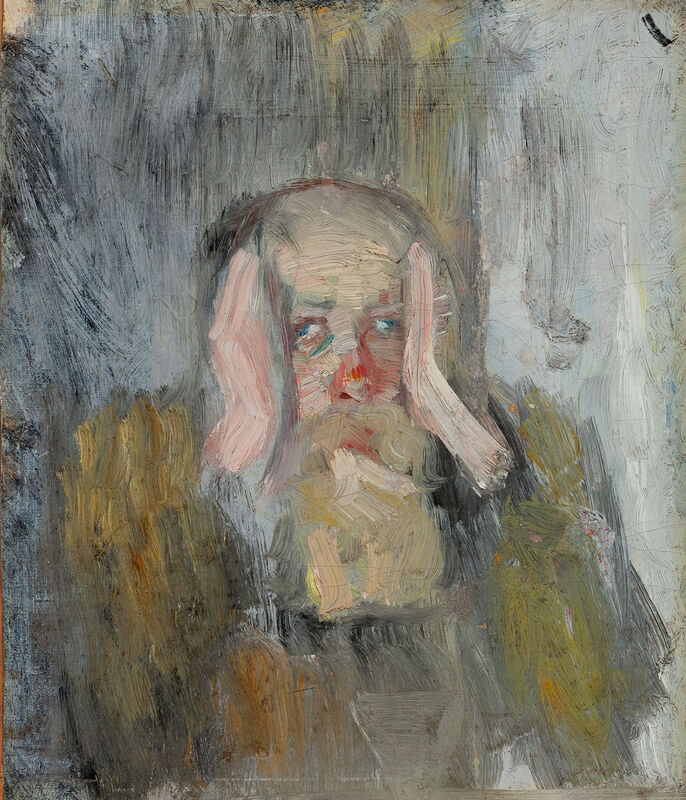 Christian Krohg (1852–1925), The Day After, Self-portrait (1883), oil on panel, 21.5 x 18.3 cm, Michael and Anna Anchers House, Skagen, Denmark. Wikimedia Commons. It contrasts with The Day After, Self-portrait (1883) which reflects the intensity of the social events held in Skagen – a true confluence of spirits. Posted in General, Life, Painting and tagged Caillebotte, Gude, Krøyer, Krohg, Lundh, Munch, naturalism, Nordström, Norway, painting, realism, Skagen. Bookmark the permalink.